Want to know what happens when a 2013 Jeep Grand Cherokee SRT8 gets turned it into a 650 horsepower ultra-performance SUV? That’s exactly what Hennessey Performance wanted to find out. This is the performance shop out of Sealy, Texas that has been making “fast cars faster” since 1991. So they took an already fast 2013 Jeep Grand Cherokee SRT8 with 470 horsepower from the factory and gave it some major tweeks and bumped up the performance. Hennessey Performance's (HPE) operates out of their main shop that has a 30,000 square foot facility and is located adjacent to Lonestar Motorsports Park, the company's test track and IHRA sanctioned dragstrip. The complex is located about 45 minutes west of Houston, Texas along Interstate 10. This is the same performance shop that took a stock Cadillac CTS-V and put a mind-numbing 1,226 hp engine in it. The CTS-V set a record on State Highway 130 at 220.5 mph. They also took a stock Chevrolet ZL1 Camaro and ran a 10.82 second quarter mile run with a 131 mph trap speed. So this team knows what they are doing when it comes to ultra-high-performance. 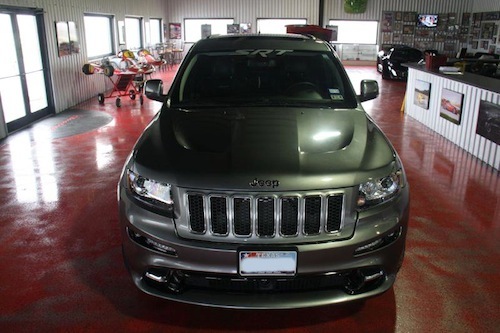 So why not turn a Jeep Grand Cherokee SRT8 into the fastest SUV on the planet? Hennessey says the HPE650 with the supercharged upgrade develops 650 bhp @ 6,200 rpm. The team just ran a chassis dyno test and it sounds incredible in the video below. Hennessey uses a Dyno Dynamics AWD chassis dynamometer rated to 2000 wheel hp. Jeep says the factory Jeep GC will sprint from 0-60 in under 4.8 seconds which is fast for a grocery hauler. We can just imagine what this Hennessey ultra-performance Grand Cherokee will do when they take it out to Lonestar Motorsports Park. Some of the goodies that Hennessey puts on the Supercharged Jeep Grand Cherokee HPE650 is a TVS2300 Supercharger System, HPE Air Induction System, Stainless Steel Long Tube Headers, High Flow Fuel Injector Upgrade, and HPE/Arrington Engine Calibration. They also include Chassis Dyno Tuning, Road Testing (up to 100 miles), Serial-Numbered Dash and engine Plaques, Powered by Hennessey Engine Covers and Hennessey & HPE650 Exterior Badging. How fast will the Hennessey Supercharged 2013 Jeep Grand Cherokee HPE650 run from 0-60 mph or the 1/4 mile? Look for Hennessey to do a test at the Lonestar Motorsports Park dragstrip soon. Check back for an exclusive interview and story on Hennessey Performance soon. Watch the Hennessey chassis dyno test of the 2013 Jeep SRT8 6.4L Hemi with HPE650 Supercharged upgrade.